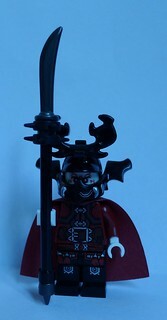 His polearm is made from a BrickArms Naginata, two Spike Rings, and the Cap piece. The figure itself is a mix of stock LEGO parts. One nasty, scary beasty. Any chance he'll be appearing in Roawia ? Now that's pretty menacing. I like the choice of colors and pieces. Well done! Ooh, very menacing. I love the staff, maybe a brighter picture so we could see it better!